As one of the popular holiday destinations following Bodrum and Marmaris, Datça welcomes hundreds of thousands of tourists every summer, but it is worth a trip to see its winter beauties as well. Datça is a spectacular peninsula located between the better-known holiday destinations of Bodrum and Marmaris that is known for its beautiful nature, history and beaches. What it is also known for is its spectacular almond blossoms, which bloom at this time of the year. Coupled by the yellow daisies that cover the ground with the first sign of the sun, the area turns into a wonderland that welcomes visitors to experience the region in all of its glory. This weekend's three-day festival is the second annual Datça Almond Blossom Festival, with the first taking place last year with the aim of promoting the local culture of the Datça Peninsula. The festival will take place in multiple locations throughout the three-day festival, giving participants the opportunity to not only discover the center of Datça, but also its historical town and the natural setting of rural Palamutbükü. The highlight of the festival will be the multiple booths showcasing locally produced almonds, regional foods and local handcrafted souvenirs that will be set up in two different fair areas in both the center of town in Datça as well as in Palamutbükü, which is nearly 30 kilometers away and will be open until 6 p.m. each day. There will be a series of natural production workshops held throughout the weekend on crafts including ceramics, lithography, notebook binding, amigurumi, origami, miyuki, soap making and candle making to name just a few. There will also be a number of culinary courses such as bread making and learning how to prepare healing ointments as well as a full schedule of workshops for kids. Multiple workshops will be taking place simultaneously throughout each day and will be held at three different locations. The venues for the workshops will be Coop, a happening live music venue, the impressive Sapphire Hotel overlooking the sea and Datça Düşler Evi a wonderful and picturesque workshop and handcrafts gallery located in the historical part of town, now referred to as Eski Datça. To attend the workshops, which will have limited spaces, participants must register, which they can do through on the website www.bademcicegifestivali.com and the entrance fee for each course ranges from TL 60 to TL 100. The fun at this festival will continue through the night with Coop Datça and Coop live opening their doors to various artists and performances all weekend-long. Coop has pretty much revolutionized the nightlife scene in Datça, becoming one of the most hip yet relaxed venues to watch up-and-coming alternative Turkish acts perform live music to a grooving crowd. Considered by many as one of the best live music venues in all of the Datça and Bodrum peninsula with some even arguing in Turkey, performances here offer that rare feel-good feeling that you are discovering something special. Amongst the line-up of numerous DJs and live performing musical outfits will also be violin and mandolin quartets, fire dancing and Poi workshops. One of the highlights of this festival weekend will be a colorful parade of people in costumes, accompanied by marching bands, which will set out from Ambarcı Street at 2 p.m. on Friday and will end up at Cumhuriyet Square. There will also be a main performance stage set up in the town center that will showcase a wide variety of local and regional dance troupes all weekend-long. 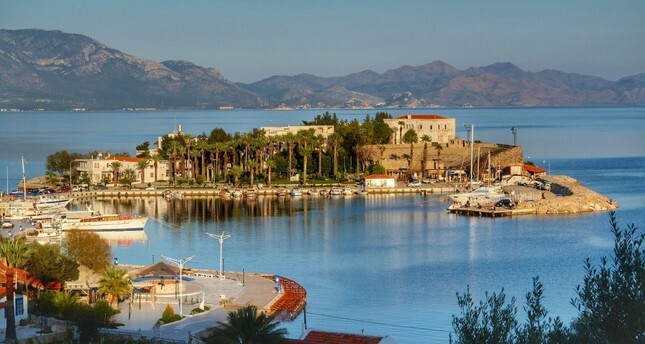 Throughout the three-day festival, there will also be three different sightseeing tours available for participants to take part in to better discover the beautiful and beloved Datça peninsula. There will be a tour of the ancient ruins of the Hellenistic town of Knidos and the more rural Palamutbükü region. Another tour on offer will be of the village of Hızırşah and the historical town of Datça, which is located slightly more inland and will include a stop at a historical church as well as a visit to a local weaving atelier. There will also be a more extensive field trip of the entire Datça peninsula in which visitors will tour the Kocamaar Farm and the Knidos Vineyard. All of the tours will take place each day with some offering multiple sessions. The cost to attend for adults is TL 60, with a discount for children.